Near-term expectations for earnings growth resulting from the Tax Cuts and Jobs Act of 2017 remain heightened. Continued Fed policy tightening, through measured increases in the fed funds rate and reductions in the size of the Fed’s balance sheet, is not expected to weigh on the economy over the next two years. Our outlook for a softer U.S. dollar is underscored by recently released CBO estimates of the projected budget deficit. 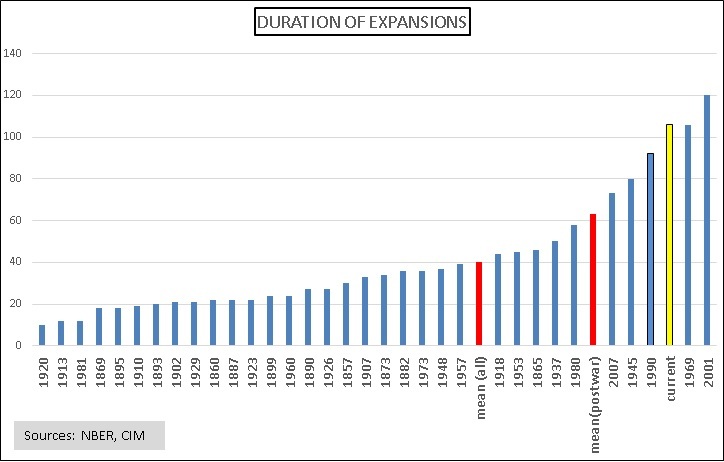 Equity exposures remain elevated across all strategies relative to our historic allocations. Our sector and industry outlook favors a growth style bias among U.S. equities at 60%. 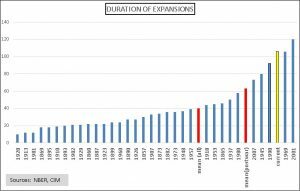 Measures of the U.S. economy continue to point to a continuation of the expansion, which is poised to tie for the second longest expansion on record and a year away from becoming the longest expansion dating back to 1854. Though the U.S. NFIB Business Optimism Index readings have moderated somewhat over recent months, the index remains elevated by historic standards. Similarly, consumer confidence has declined recently, as measured by the Conference Board’s Consumer Confidence Index and the University of Michigan’s Index of Consumer Sentiment, yet remains at high levels. The recent declines notwithstanding, the Federal Reserve’s efforts to reduce its balance sheet and raise the fed funds rate multiple times this year and next appear to continue unabated. While our view is for continued economic growth until nearing the end of our three-year forecast cycle, we remain wary of the potential for a misstep by the Fed that would lead to excessive tightening and increase the odds of a recession. Such wariness is balanced by the prospect for an uptick in GDP from its mild post-recession figures. The combination of the fiscal stimulus in the latest budget accord and the corporate and individual benefits unleashed by the Tax Cuts and Jobs Act of 2017 set the stage for potentially rapid growth over the next two years. With a higher level of GDP growth, we would expect the Fed to be more hawkish in its tightening over the next two years, which would thereby impede the nascent inflationary pressures that caused investor angst in early February. The domestic economic environment we forecast for our three-year cyclical outlook is supportive of range-bound intermediate and long-term rates and equity valuations. Specifically, inflation expectations of 2.1%-2.2%, inferred by the breakeven rate of TIPS versus maturity-equivalent Treasuries, underscore our thesis of the current fair valuation for equities and bonds. From a global perspective, the recent saber-rattling on trade and tariffs has the potential to be highly disruptive to global economic growth. While we harbor optimism that cooler heads will prevail on matters of trade, the rise in populism keeps our hopes for unfettered global trade in check. Although trade accords, such as NAFTA and TPP, offer the potential for improvement, we are less than sanguine that they will be resolved amicably, at least absent a high degree of histrionics. Among non-U.S. economies, Europe is three years into its economic expansion. Though facing political headwinds, most recently illustrated by the Italian and Hungarian elections, the European economic climate is improving. 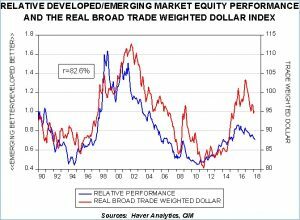 In addition, our analysis of purchasing power parity of the U.S. dollar versus other major currencies indicates continued overvaluation despite recent softness, which should prove to be a tailwind for returns of non-U.S. equities for U.S.-based investors. 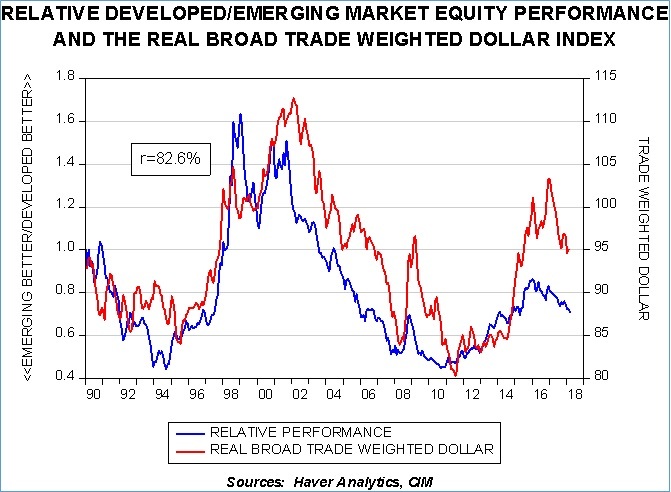 As the accompanying chart illustrates, the environment for emerging market equities is particularly attractive. Our views on U.S. equities are favorable. We expect inflation to remain contained, accompanied by low levels of unemployment. We also expect an increase in earnings spawned by last year’s corporate tax reduction, and an increase in share repurchases and M&A activity stemming from the repatriation of overseas assets. 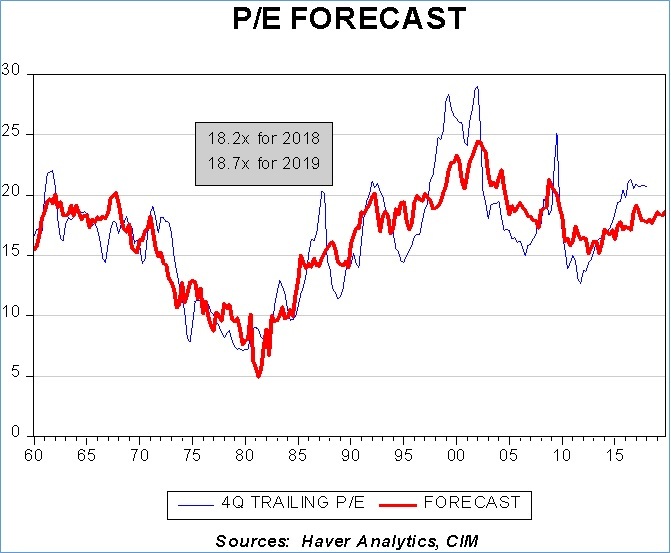 Our positive forecast for equities reflects our expectations for P/Es, as depicted on the accompanying chart, which encourages elevated exposures across all strategies relative to our historic allocations. At this stage of the economic expansion, we retain a 60% tilt toward growth and 40% to value. In U.S. large caps, we overweight energy, financials and materials, while establishing an equal weight in technology and consumer discretionary in anticipation of their reconstitution as part of the new communications services sector in September. Mid-cap and small cap equities have an identical tilt to growth and are both overweight in the more growth-oriented strategies. Outside of the U.S., we retain our historic maximum exposure owing to our expectations of a continued soft U.S. dollar. As we noted last quarter, the rise in Treasury yields since the passage of the tax legislation has many commentators suggesting a bear market in bonds has developed. The jump in rates in early February added further fuel to their argument. 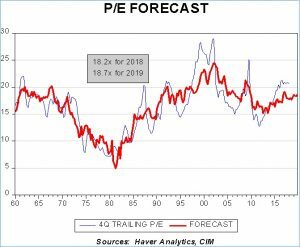 While we understand and appreciate their premise, our view is that such a bear market will be secular and, accordingly, will require years to unfold. As evidence, we review the figures from the secular low in 1945 and the two decades that ensued prior to rates becoming a problem for financial markets. Absent inflationary pressures, we uphold our forecast for a gradual rise in rates that will be borne mostly by the front-end of the curve as the Fed maintains its tightening measures, inclusive of the reduction in its balance sheet. Accordingly, we expect the curve to continue to flatten, with the intermediate and long-term maturities being range-bound over our forecast period and a terminal fed funds rate of 2.50%-2.75%. Our expectations for a gradual rise in rates reinforce our use of a bond ladder in strategies that have income as an investment element. Bond ladders hold the dual attraction of offering a degree of defense against rising rates through capturing the roll yield while also allowing maturing issues to be deployed at the longer rungs of the ladder, benefitting from the yield advantage farther out on the curve. The laddered nucleus will modestly reduce the overall duration from one quarter to the next until a new rung on the ladder becomes available later in the year. Relative to spread sectors, we maintain exposure to investment grade corporates in the ladder and a concentration in the intermediate segment of the yield curve through the use of an ETF containing mortgage-backed securities. Speculative grade bonds hold less allure as spreads have tightened and have double-digit exposure to telecommunications company debt. As a result, we substantially reduce exposure to speculative grade bonds. We retain our allocation to real estate in the more income-oriented strategies given attractive and improving dividend yields, while reducing the REIT allocation in risk-tolerant portfolios. As a function of yield relative to potential risk, we view REITs more favorably than speculative bonds. We introduce an allocation to gold this quarter within commodities, where we have been void for the past year. 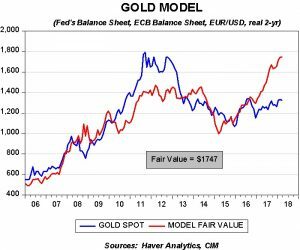 Recognizing that gold can serve as a safe haven during periods of heightened geopolitical and currency risks, we are incorporating a modest allocation as a means to temper these potential risks. 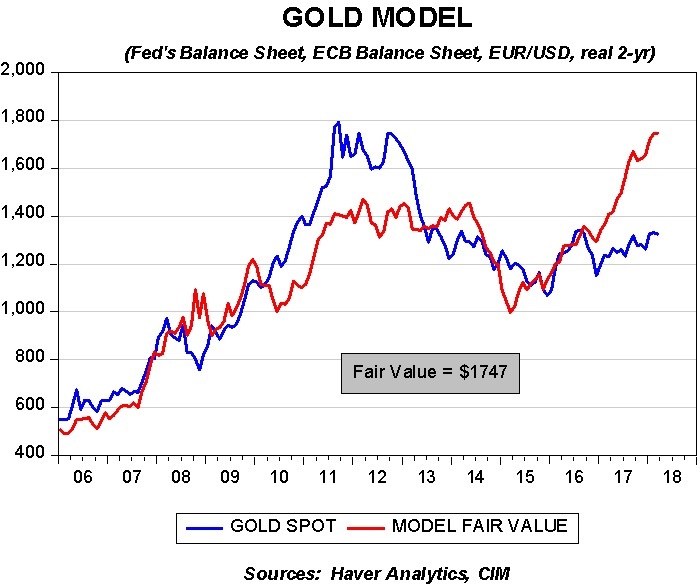 Moreover, our analysis of the fair value price of gold indicates it is currently attractively priced, as depicted on the accompanying chart.